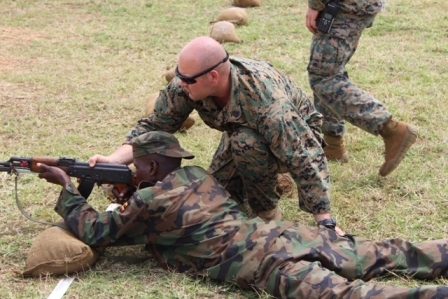 A gunnery sergeant with the U. S. Marine Corps Forces, Africa trains a Ugandan soldier. By Hakeem A. Buuza, via AFRICOM. Many Ugandan and central African commentators have written and spoken about the one-sided and oversimplified nature of the “KONY 2012” video. Reporting from Uganda’s capital city Kampala, Associated Press writer Rodney Muhumuza noted that former United Nations Special Representative for Children and Armed Conflict Olara Otunna has long accused the Ugandan government itself of committing acts of genocide, in part using Kony as an excuse in its policies against the rural north. Otunna, himself a member of the Acholi ethnic group and a leader of the Ugandan Peoples Congress, has termed the decades-long forced relocation of Acholi and other northerners “the secret genocide,” where huge portions of the population have been housed in poorly-equipped internment camps, with up to one thousand perishing weekly. Black Star News editor Milton Allimadi, speaking at New York’s Left Forum on March 17, also suggested that the Ugandan government shares much of the blame, imploring us that “when you allow Kony to be the focus, you exonerate someone else even more responsible.” By taking Kony and the LRA out of their historical context, the best that can be hoped for are simplistic and ineffective solutions. A more holistic approach has been documented in the work of Uganda’s Raising Voices, whose co-director Dipak Naker has worked extensively in the development of broad-based, child-centered interventions.